Villa la Estancia is a beautiful private (full time ownership) 5 star resort located on Medano Beach. Town is just a short walk or you can take a water taxi right from the beach. The resort has a beautiful infinity pool with a swim up bar. You can also enjoy the five ocean view hot tubs. The La Parilla Grill is poolside and the beautiful La Casona offers outstanding gourmet cuisine, and of course room service is available 24 hours a day. 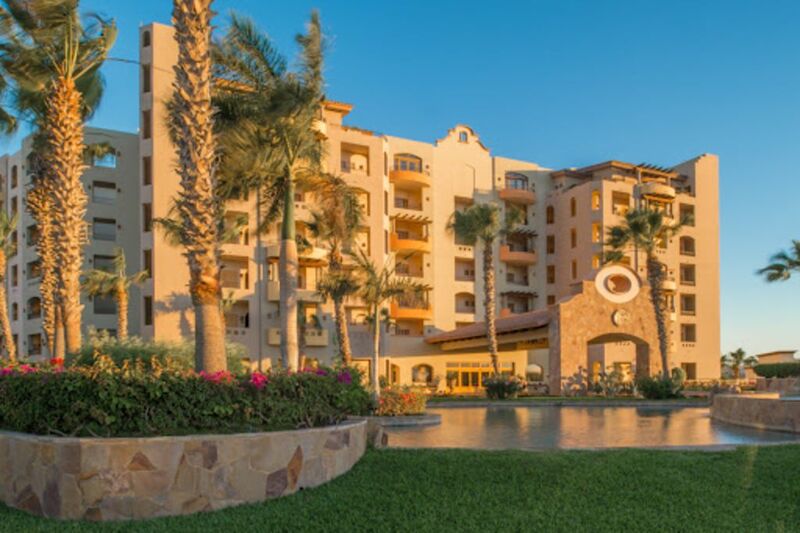 Guest have privileges at both the Villa Del Palmar and the new El Arco right next door. They have several additional restaurants on site, a children's program and a new full service European Spa and gym. There is also a supermarket, pharmacy and deli on site as well as an internet cafe, video rental and ice cream shop. Taxi's to town are readily available right outside your door or if you choose to rent a car there is underground parking available at no extra charge. Our ground floor unit 2206 (for additional dates our co-owners listing is 372523) makes it easy to walk right out your patio to the pool or beach. It is set back from the main walkway for a very quiet and private patio setting. You can even have a private dinner catered on your patio or have a romantic dinner right on the beach. The unit is elegantly furnished with an entertainment center with TV/DVD and a CD player. The formal dining has seating for six and also has a convenient breakfast bar for 3. The kitchen is fully equipped with everything you will need for cooking your own meals during your stay and there is also a gas BBQ on the patio. The master bedroom unit has a king size bed, sitting area, TV/DVD and an oversized bathroom with a jacuzzi tub, separate shower and a double vanity. The living room has a queen size convertible sofa. The second bedroom can be rented separately if desired and it has 2 queen beds with a full bath and a mini refrigerator. We have been vacationing in Cabo for over 15 years and have plenty of suggestions to make your vacation memorable. Let us know if we can help set you up fishing, snorkeling or cruising. We have several great companies we have been using for years. We loved our stay at Estancia, and the Afdem family were very responsive, and accommodating. Would highly recommend considering this property, as everything was first class. Will definitely consider booking again. The owners provided us with excellent service, help and tips on traveling around Cabo. The location and beaches are perfect. Beautiful home with everything you need for a perfect vacation. Thank you so much for allowing us to stay! Our vacation stay in unit 2206 at Villa la Estancia was amazing! The unit is beautiful and clean, very spacious. We were with our three teenage boys, each over 6' tall, and were completely comfortable and had plenty of space to spread-out. The kitchen is extremely well equipped, organized and easy to operate in. We cooked breakfasts, and prepared one dinner, and had every utensil and all the kitchen equipment we needed. Truly, the best part was the accommodating and helpful owners. We had not been to Cabo since our honeymoon 25 years ago, and were unfamiliar with the territory. They made our trip easy with their spot-on recommendations and suggestions, speedy email responses and friendly style. They even referred us to a wonderful professional photographer for our family/25th anniversary photos. We had our best vacation ever, and will be repeat guests for sure. In fact, we won't stay anywhere else in Cabo again! This was our 2nd trip to Cabo & our 2nd time staying at Villa La Estancia. This ground floor villa was perfect. Walk right off the patio and onto the poor or the beach. The villa, the facilities, the service was amazing, but most importantly the staff is what makes this place a true 5 star resort. They will go above, beyond & totally out of the way to accommodate & assist you and always with a smile, We rented directly from the owner. He was very easy to work with. His emails & responses were very quick, direct & informative. This 2 bedroom villa was the perfect fit for my wife & I and our 2 teenage sons. This villa is a great fit for families. We had a grill on the patio which we made use of. We normally will cook 2-3 meals in and the rest of the time head down the beach or into town for breakfast , lunch or dinner. Along the beach I would recommend Tobasco's or The Office. Both have great breakfast & lunches. In town - Claros Jr , this is a hole in the wall taco stand with great food & prices. You can get a smoked marlin taco, a shrimp taco (with 5 pieces of shrimp) & a sea bass taco with a bottle of coke for about $5 us. Maros is a favorite. Steak, lobster & shrimp for $16.95 us plus this is a fun lively atmosphere. Want Italian with a Mediterranean flare, Invita Bistro is fantastic, more upscale though. You, really, do not need to rent a car if you are spending your time on the beach or in town. Cab ride is $9, bus is $1/person, water taxi is $5/person- but you can sometimes negotiate this down to $10 for the ride for 4 people. I would recommend the water taxis for going to The Office or the marina if you can get it for $10. The bus system is an adventure in its self. It picks you up right outside the property & will take you to Wal-mart or into town for only $1. If your going to Wal-mart I recommend taking a taxi back, easier than lugging all your groceries/items to & off of the bus. Plus, I've found at Wal-mart to be some of the best deals on excursions & activities. Not the store itself but a corner kiosk by the exit. These guys will try and sell you on taking a time share tour of the 2 properties on either side of Estancia (I do not recommend that- don't be fooled will actually take 3 hrs of your time-no matter what they tell you) but they have great connections with some of the activities as long as you are good at negotiating. We first visited in 12/2013 then again last week 3/2016. First the Villa. I can't think of the person who would not rate this Villa anything less that spectacular. As soon as you are escorted with your bags to the front door, it opens into a pampered / exquisite space. Every little detail has been thought out and the owners have assured this villa has what is needed for you to want little with upscale appliances, furnishings, and amenities. This Villa is nicer than my own home, it's clean and well appointed, if there is anything left out you soon just deal with it because 99.9% of everything else has been thought of. I wake early and slip into the common area and make coffee, then enjoy it on the very large patio listening to the birds, looking at the flowers, and watching the resort staff at work manicuring the grounds. It's a constant with the staff, they are always manicuring or cleaning something. Being on the ground floor allows you to just pass through the gate and you have access to beautiful hot tubs or the pools just a short walk away. Very convenient over higher units. That leads to the resort. It's clean, quiet, and beautiful no matter where on the grounds you are. They take great pride and it shows with the property and their attitude. They are always striving to make your stay memorable. You can request anything and they are there to make it happen. I hope to visit often.